There is nothing quite like a first Mother's day for a proud new Mother. 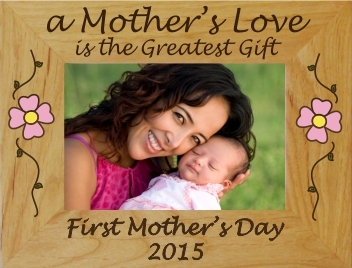 Buy her this unique personalized First Mother's Day frame and she will have a treasured keepsake for many years to come. The quality hardwood frame is laser engraved with wonderful floral accent designs. Frames have an easel back and glass window front and can be hung on a wall or displayed on a table top, either vertically or horizontally. An aSpecialGift.com exclusive frame! Just for Mom on her first Mother's day. We offer this frame in three different sizes, in horizontal or vertical orientation to fit that special photograph.